"Extreme realism describes my art," explains Nancy Bautzmann O.P.A. "My technique is in remembrance of the old masters, with a transparent underpainting and opaque overpainting." Her subject matter is taken from her life and surroundings. Since Nancy spent a large part of her childhood in England, the teatime was an important part of her life. 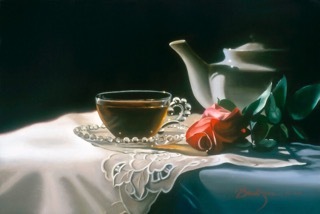 Those memories return over and over in her many still life depictions of the English tea settings. "They call me the tea lady," Nancy says of her art students. "I love to drink it, I collect teapots and tea cups, and I love to paint them." So realistic are her shiny silver teapots, and porcelain teacups on can almost smell the tea. And always in these paintings are reflections — reflections of the teacup in the teapot, or the teapot in the polished mahogany table. "Reflections and contrast are important themes in my work. I enjoy creating a three dimensional effect, giving a feeling that you can pick the objects out of the flat surface." “Aura” oil on linen 12”x18"
Her paintings of teacups and teapots come to her as ideas that "slip into view as an elusive shadow" during quiet moments. Some paintings exist as an idea for a long time as she visits antique shops and collects just the right combination of objects for what she has in mind. "Abstraction is seen in my still life by the reflections of the whole painting stretched and pulled in the images of the items painted. It is very hard to find a brushstroke, as the texture of the canvas is more visible. The colors are true to life due to a deep study in color." Her backgrounds are always blurred, almost as reflections themselves. 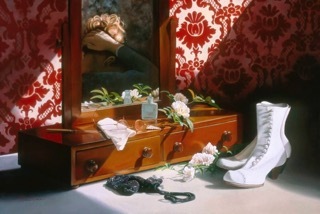 The main objects stand out in crisp realism as if waiting to be plucked from the canvas. “Peace of the West” oil on linen 12”x18"
Nancy did not start her life as a painter, but after taking a figure drawing class in college, she was hooked for life. 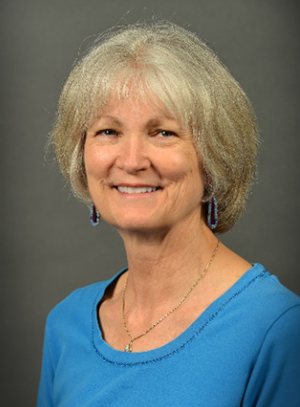 After obtaining a degree in Fine Arts from Westminster College in New Wilmington, Pennsylvania in 1974, she first went to work in the field of advertising as a graphic artist. However, she attended numerous workshops and continued to study under such noted artists as Robert Hild, Hans Axel Walleen AWS, Gloria Malcolm Arnold, Mark Milhof, and Gunter Korus. In 1987 she stopped working in advertising, rented her own studio, and put her heart and soul into painting. She taught art lessons in the local museum in Pittsfield, Massachusetts, built her own studio, and became president of the Pittsfield Art League. In 1994, she moved to Tucson, Arizona. 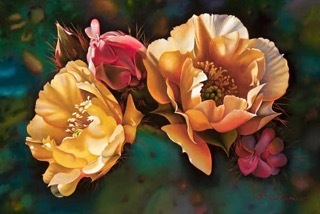 She paints both in watercolors and oils and has added desert scenes and flowers to her portfolio. She is currently showing at the Salmagundi Club in New York City from September 17th through October 1st. 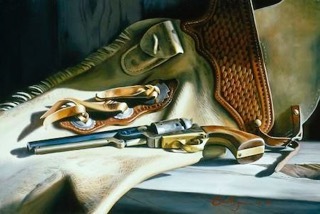 “Tombstone Rose” oil on linen 24"x36"
Her artwork has been shown in many galleries on the east and west coasts. She has also received numerous awards from both national and international exhibitions including 1993 Best in Show — Pittsfield Art League Annual Exhibition — Grumbacher Medal, 1994 1st Oil — Kent Art Association, 1995 — Best in Show Southern Arizona Watercolor Guild — ASDM, and the 1998 Merchandise Award — Oil Painters of America — Washington DC. Starting in October 2009 her paintings will be on exhibit at Sanders Gallery in Tucson, Arizona. 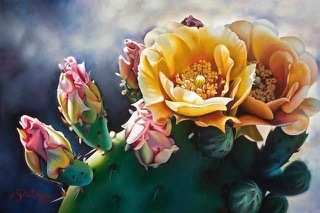 She is a signature artist of Oil Painters of America and Southern Arizona Watercolor Guild. She was a signature artist with The Copley Society of Boston for several years. "My technique is in remembrance of the old masters, with a transparent underpainting and opaque overpainting."